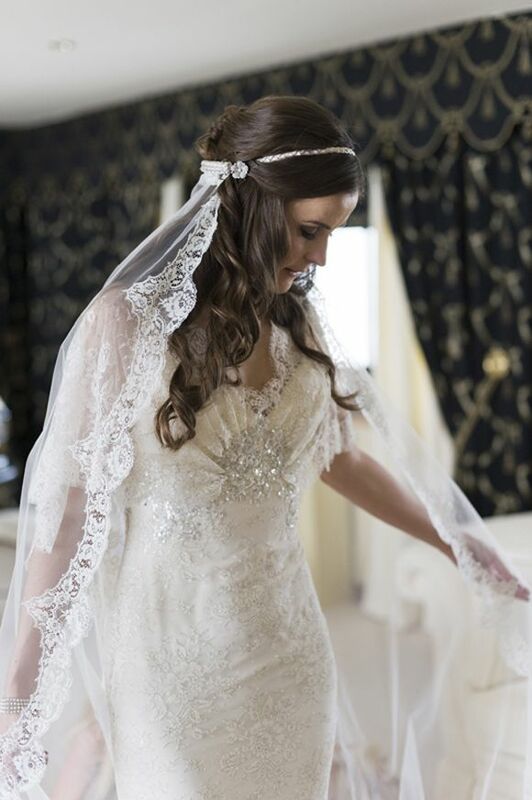 I am so, so, so [cannot say so anymore] in love with mantilla veils at the moment, they are absolutely, gloriously, gorgeous and can make an incredible romantic, bold or chic bridal statement, dependent upon what style you’re going for. Mantilla veils are made of exquisite materials and trimmed with intricate lace patterns of many different shapes, thickness’s and delicacies. 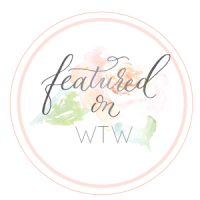 So of course, it brings me absolute pleasure today to share this fab guest post from Gloria of The Mantilla Veil Company, Gloria gives us the low down on the veil of the moment. 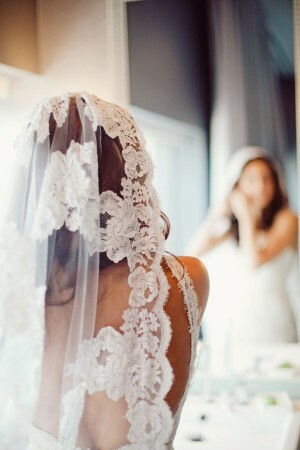 The mantilla veil. 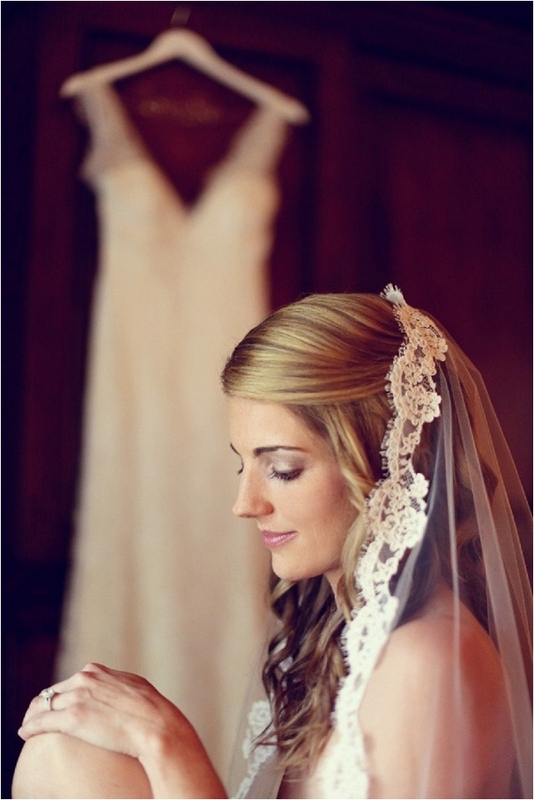 Many of us are captivated by the timeless quality and sophistication of a mantilla veil. These lace beauties are highly desirable but, when it comes to wearing one, we are completely puzzled on how to do so. 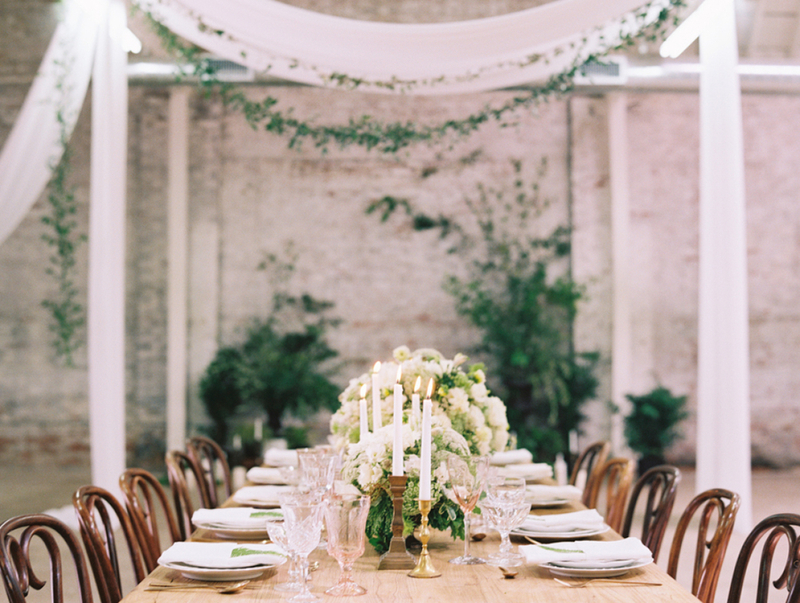 These tips will guide you to making the right style choices for your big day. The first thing to consider when wearing a mantilla is your hairstyle. Just about any ‘do will do except for a high bun, which can obstruct the way the mantilla lays on the head and over the shoulders. I’ve found hairstyles that best compliment a mantilla are those that are low, soft and/or flowing. Low side buns, soft curls or half up styles are all fabulous choices! 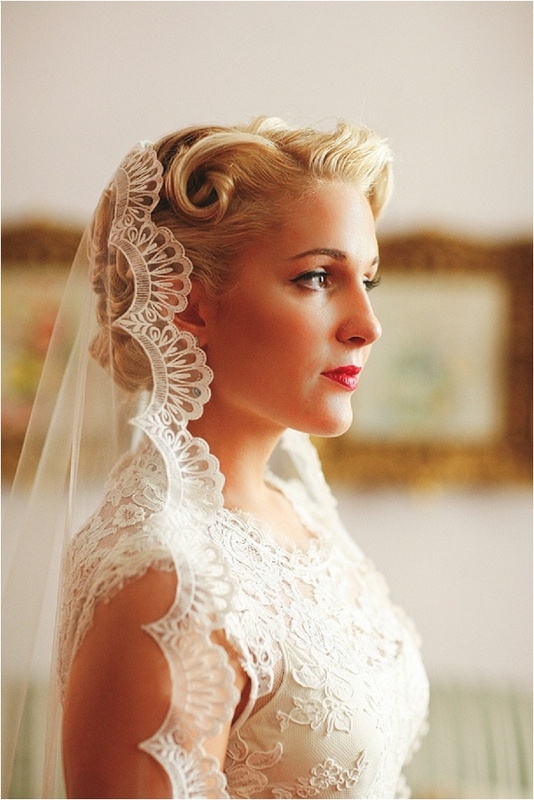 With a mantilla, you have 3 placement options: the top of the head, the crown or the lower back of the head. 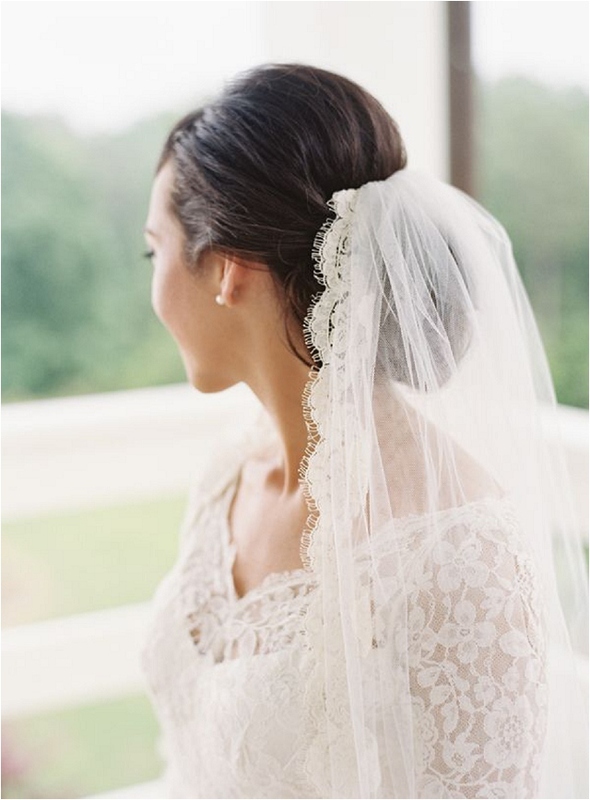 Wearing a mantilla at the top of the head gives you a very traditional look and allows the lace to drape nicely on the sides of the face and over the shoulders. The key to getting this look right is to place the edge of the veil 2 inches back from the hairline. 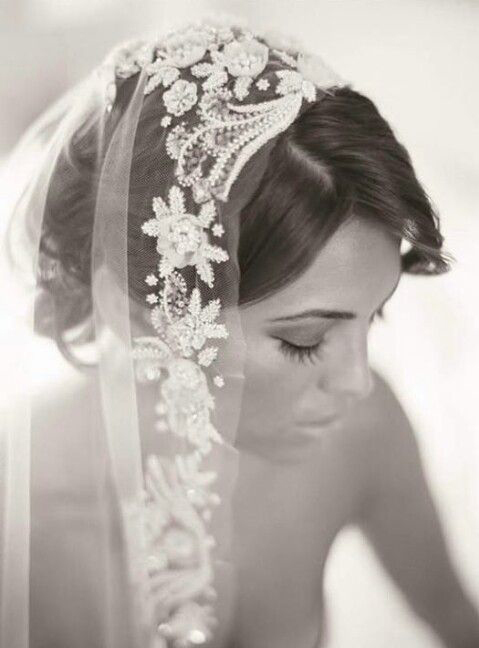 For a modern approach, place the mantilla at the crown of the head. 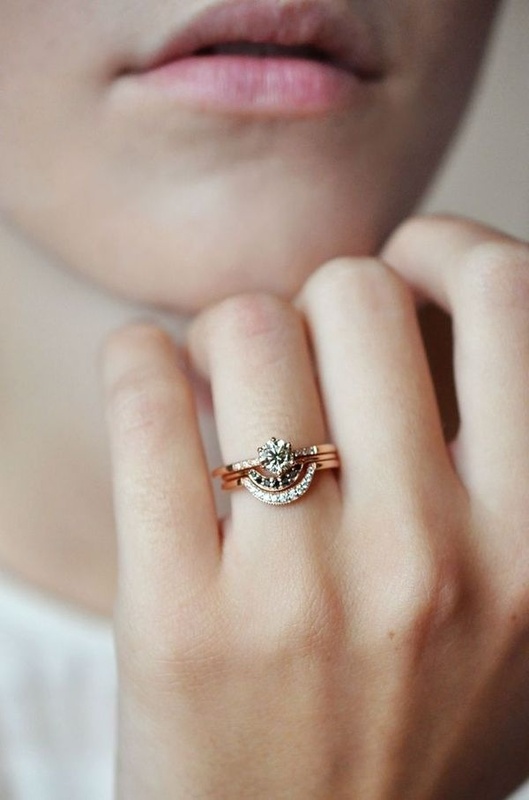 This look gives you the perfect opportunity to showcase heirloom pieces such as a hair comb or broach. If your mantilla has a blusher, this would be the ideal placement to ensure the blusher hangs low enough to cover the face. 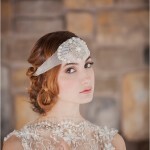 Lastly, you can wear the mantilla at the lower back of the head to create a renaissance look that is truly romantic! This look works best with a lower bun or half up hairdos. To keep this look current, be sure to place the comb above the hairstyle and not underneath. The last thing to consider (but certainly not least) when wearing a mantilla is the dress. 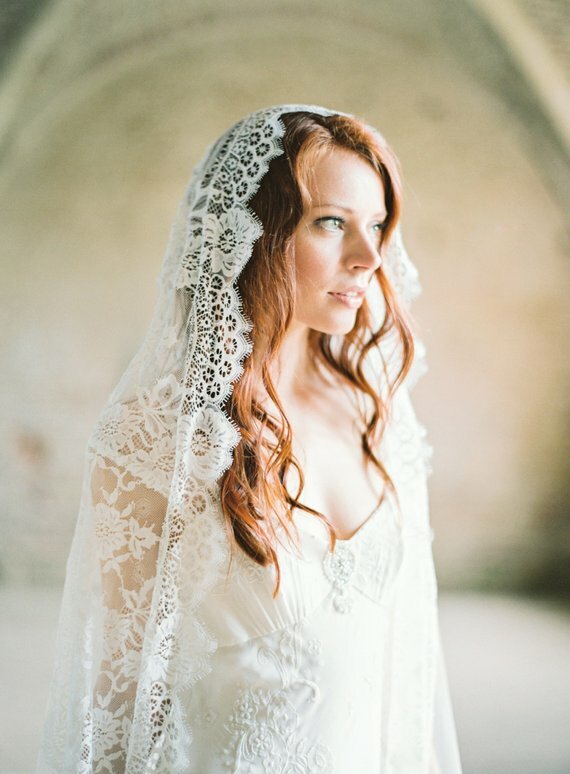 A lace dress paired with a mantilla is stunning as is a satin, chiffon, or any other material! The real deciding factor here is fit. We all want to be princesses on our wedding day but unfortunately, a puffy princess gown simply won’t do. Instead, opt for a silhouette that elongates the body and gives shape, allowing the mantilla to form a beautiful lace halo around the body. 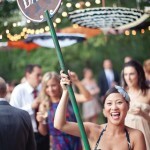 I hope these mantilla tips helped answer all of your styling questions. 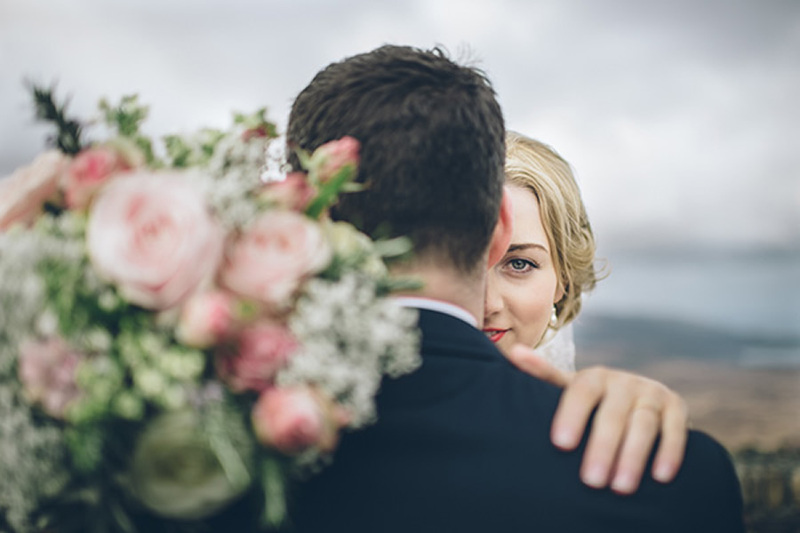 If your heart is set on a hair, dress and mantilla combination that doesn’t follow these guidelines, just try them on together. 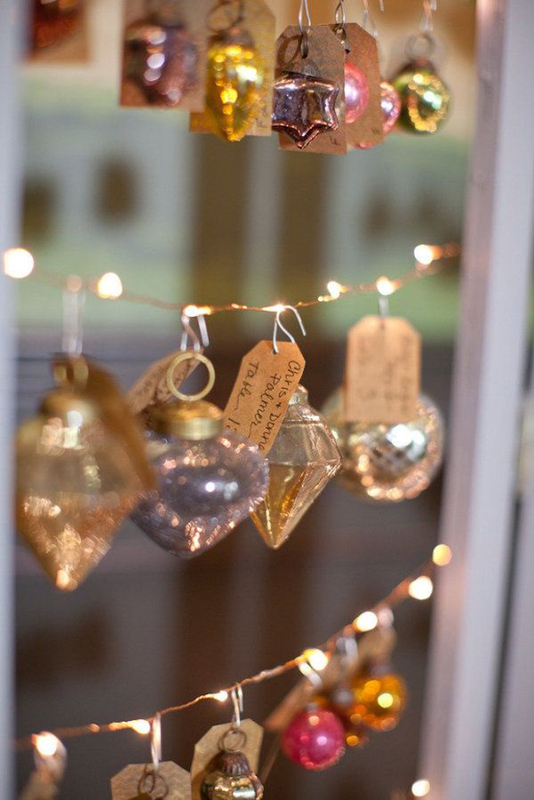 Ultimately, it’s your big day and you should wear what you feel most comfortable and beautiful in! 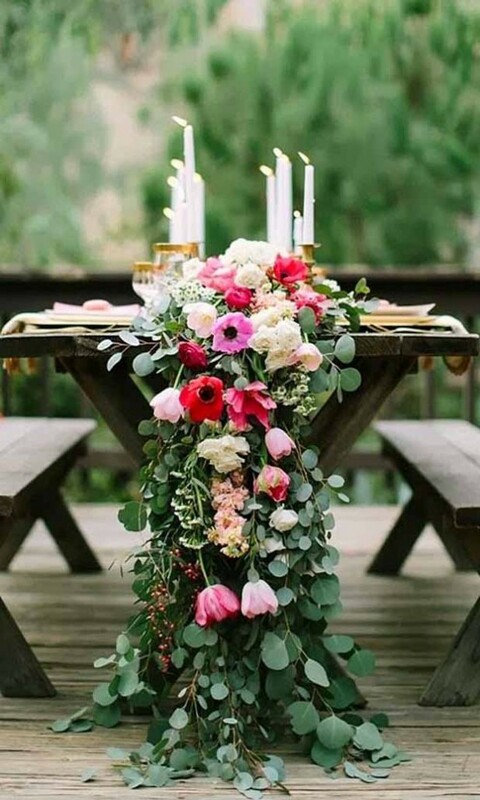 Guest post by Gloria Franklin from The Mantilla Company. 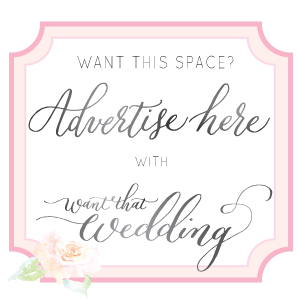 The Mantilla Company is an online retailer for affordable wedding veils handmade in Spain. Each veil is carefully handcrafted from European materials to ensure the highest level of quality. Just a couple of tips I’ve noticed about the mantilla veil recently (mainly via pinterest). I’m increasingly seeing mantilla veils worn as drop veils, knotted at the nape of necks and also worn very far forward on the head, sometimes even across the brow. 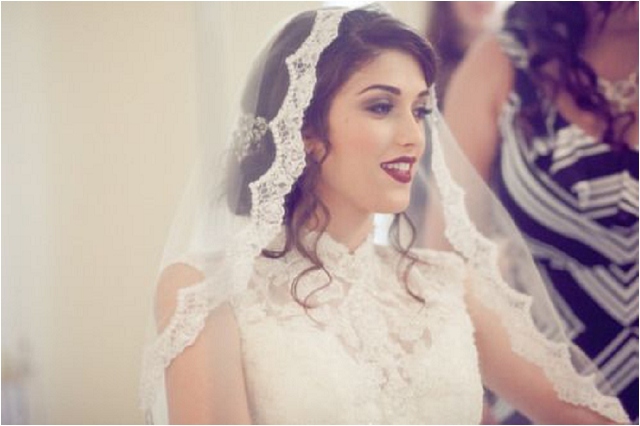 So has this article inspired you to embrace the mantilla? 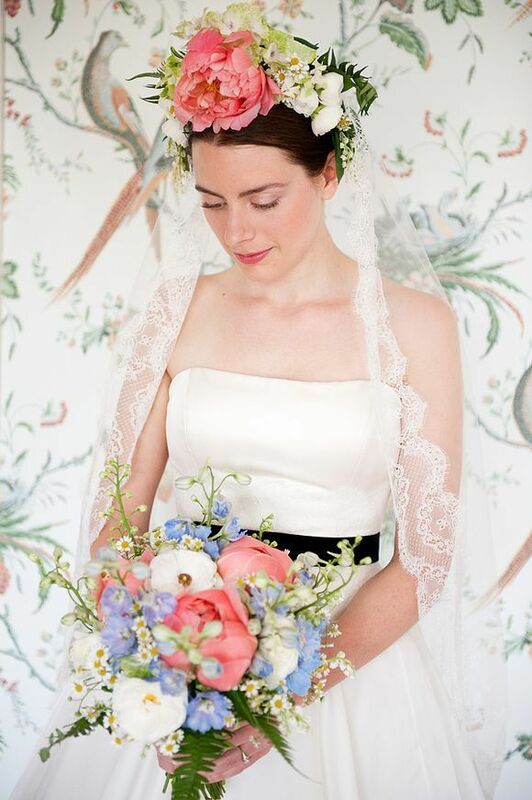 My favourite way to wear a mantilla is with a large bold lace scalloped edge worn at the front of the head so the edges frame the face… utterly romantic and mesmerisingly pretty. What you don’t mention is how to keep the mantilla in place, without obvious Bobby pins, combs, or clamps.